Stand by for incoming missiles! Modern architecture purists all over town won’t want to hear what’s coming next: Citrus Square, a retro, faux-European mixed-use building on North Orange Avenue, is a graceful and valid addition to our cityscape. So there…fire away. Sited on Orange a block north of Fruitville Road, Citrus Square is a welcome move by a smart developer toward extending downtown urbanism past that unfortunate barrier to pedestrian access that is Fruitville Road. The gradual upgrading of Central Avenue has begun to beckon shoppers and diners northward, but the process is slow, due in part to the ordinariness of the commercial buildings immediately flanking either side of the vehicular artery and the challenge of crossing it. At Fruitville and Orange, however, one can catch an intriguing glimpse of Citrus Square behind an awkward bank building and opposite the remaining cottages on the east side of the avenue, tempting even the casual driver to turn northward to see what it is. What it is, is a single structure, the first of two that will flank a central piazza, made to resemble a line of typical French downtown buildings, with shops and restaurants on the ground floor, residences above. When complete, the development will fill the space between Fourth Street and Boulevard of the Arts, appropriately named in this case. Architect Chris Gallagher of the Jonathan Parks architecture firm has certainly done his homework, researching both the originals in this style in Europe and their previous expression in such American cities as Lowell, Mass. Gallagher has designed a series of facades that do not seem to be pasted on the single structure behind them. He’s achieved this effect through the skillful use of diverse materials and architectural details for each “building” and varying colors and finishes, giving some areas a slightly different way of meeting the sidewalk. Varied balconies, windows and terraces rise to a variety of rooflines. On the back of the building, the entrance walkways, too, have varied setbacks of a simpler kind overlooking the parking and service areas. Gallagher says he sees this project as a way to “build a neighborhood,” preserving the modest residential scale of the north side of town while creating housing and commercial spaces for the kind of young population we seek to attract to our downtown. That he has chosen to do so in a manner that must be more expensive than the sadly typical “Med-Rev, Styrofoam-and-stucco” seen around Sarasota is especially commendable. For instance, the doors on the ground-floor shops are exceptionally handsome, solid wood with high-quality hardware, matching the window frames on either side of the entrances under awnings of varying designs for each section. Door frames and lintels are substantial, as are the balconies above, subtly detailed differently for each “building,” and furnished with impressive iron railings unique to that particular part of the facade. One way to encourage neighborliness is to slow traffic, a principle seldom honored in these days of high-tension driving while multi-tasking doing heaven knows what. Citrus Square has diagonal parking in front of Citrus Square, using the same method that has worked so well on Main Street, forcing traffic to wait as cars move in or back out of the spaces. Presumably, achieving this with the consent of the city authorities has not been easy, which may account in part for the project having been underway since 2005. Nonetheless, the results are well worth the effort and the wait. The interiors of the building, unfinished at the time of writing, are exceptionally generous and airy, with high ceilings and careful detailing. The commercial spaces, which may eventually include restaurants at either end and retail between, should be very attractive when they are built out and occupied, bringing life to the street with shoppers and diners both inside and out mingling with the owners of the condominiums above. The residential floors, too, are notable for their generous space, particularly the 10-foot ceilings, eight-foot doors and stately casement or double-hung windows. Specified finishes, too, are of higher quality than those customarily found in this kind of building, exemplified by hardwood floors throughout. Floor plans are ingeniously varied, ranging from one-bedroom, one-bath end units to the two-bedroom, two-bath apartments with terrace and the largest residences with an added den/study. Even in their unfinished state, these were strikingly airy, with attractive city views and a strong sense of being part of a potentially vibrant downtown. Apartments of such diverse size should guarantee a diversity of ownership, responding to a wide range of prices, some quite affordable. The vision for Citrus Square, achived through Chris Gallagher’s design, have given Sarasota an attractive new urban amenity, where architectural scale and integrity are expressed with confidence and creativity. While we should not deny the need for significant modern buildings in our city, we cannot fail to appreciate quality when we see it, even if it is found in a building which looks to an elegant past for inspiration. Citrus Square has done so with exceptional flair. 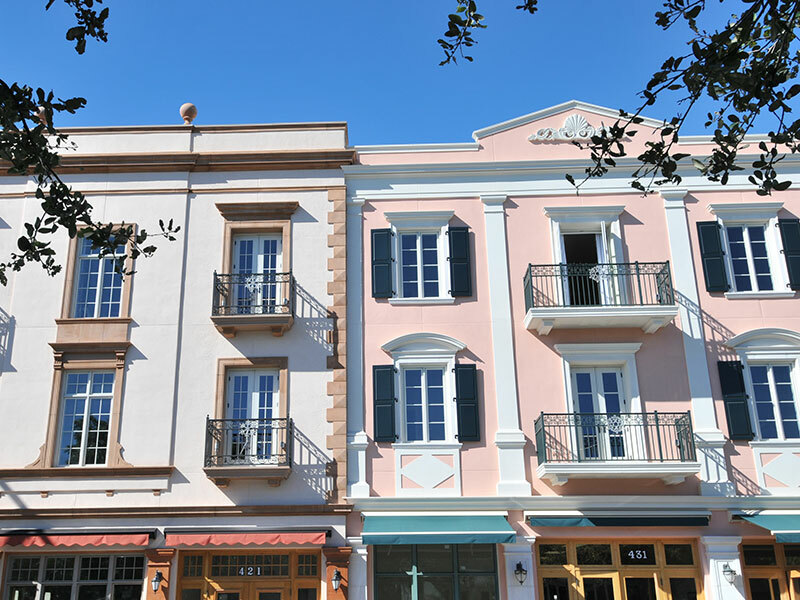 Using more expensive materials than the area’s typical Med-Rev structures, Citrus Square’s retro, faux-European facade brings color and variety to the northern part of downtown. It’s a single structure, made to resemble a line of typical French downtown buildings, with shops and restaurants on the ground floor, residences above.